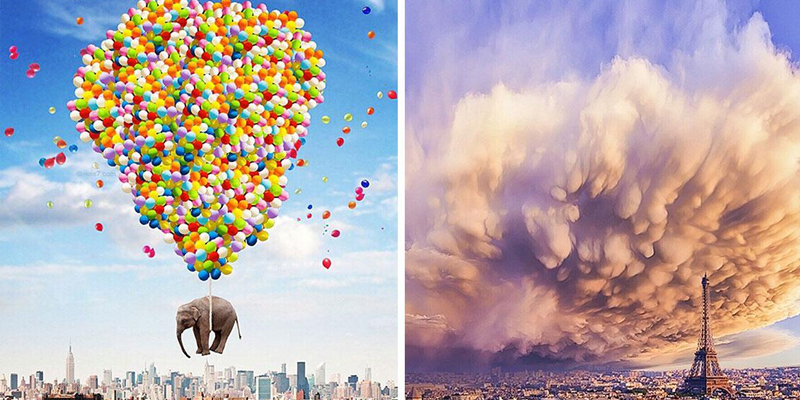 Robert Jahns is master of photo manipulation. Using nothing but his iPhone to shoot and edit, Jahns bends reality and twists the very laws of nature. Going by his artist name Nois7, the German artist typically finds himself taking photos for his collages during vacation time. Over the years, his hobby has turned into a full-blown art project. Not only does his work get a lot of attention on social media, Jahns has even begun exhibiting and selling his work around the world. ✨ Sleeping under the clearest skies of the world. Who would you like to count the stars with? Quick reminder that you can get all my prints 20% off now, link in my bio. Somewhere over the rainbow ? Who would you like to stay with? ? This is a creation I did 1 year ago for the amazing landscape photographer and director @chrisburkard who still is a great inspiration. When I live in New York City I will build a swing on a rooftop! How awesome would this be? Wanna get this image as a smartphone wallpaper? Download it on my website nois7.com linked in my bio ? A home is made of hopes and dreams. I realized not all of you are able to see my posts and I don't know why. Here comes a tipp: If you follow me you can go to my profile, click the 3 dots in the top right corner and turn post notifications on to be notified whenever I post. Dear whoever is reading this, smile! Life is too short to be unhappy. Yesterday I missed the national puppy day so I thought I gotta post that image of Norm flying with balloons today. Such a fun image I did for @jermzlee. When your life feels black and white, make sure that you dream in color. Who would you slide with? If you never chase your dreams, you will never catch them ?